A modern and recently refurbished self catering holiday apartment located in the very centre of Cascais. 50M away from the nearest beach and located just off the main street in Cascais (Rua Direita) the apartment is perfectly located for holidays in the centre of town. Close to restaurants, bars and shops the apartment's location cannot be beaten. Visit the local food market, approximately 5 minutes walking to get fresh local produce. location to everything. Staff was very nice and helpful. The apartment has a very good position. In 1 minute we were at the beach and also in the city. That was great to create our days flexible with our baby. Furthermore the apartment is equipped with the important things to cook. Thank you! 100% recomendable para pasar unos días. Es un apartamento ideal para quedarse a dormir y hacer turismo por la costa lisboeta. Hay un parking cerca y hay zonas de aparcamiento de pago a 10 min andando. Cassie la anfitriona nos ha ayudado en todo lo que hemos necesitado. We stayed in this apartment in October 2016.Apartment is clean and cozy. The biggest advantage is the location with supermarket, railway station, numerous restaurant and few beaches within 5 min walk. Portugal Portfolio's crew was very friendly and helpful. Regarding the apartment, we got positively surprised when we got into. It is better even than in pictures in webpage, spacious, well-equipped (superb) and in a privileged location at Cascais. 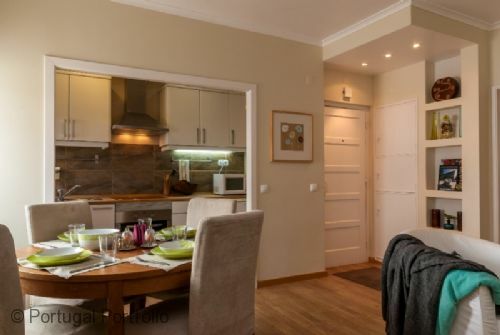 Rainha Apartment, Cascais: an excellent, comfortable and spacious apartment in a very central location; good connections by bus and train to Lisbon, Guincho and Sintra. Literally minutes from several clean beaches, the harbour and shops, including two big supermarkets and a fantastic market with fresh fruit, vegetables and fish. Plenty of restaurants, cafes and bars as well, serving a large range of food to keep everyone happy. The apartment has everything you’d need for a self-catering holiday, and has a compact but fully equipped kitchen that includes a washing machine, cooker, oven, microwave, toaster and coffee maker. It felt like a home from home, but with better weather! The Portugal Portfolio rep made us feel very welcome and answered any questions we had, and was available throughout our stay – which is very reassuring. In all, a fantastic holiday which we won’t forget in a hurry. The Holyday home was so good, IT was very clean. The situation in Cascais Vila was unsurpassable and very central. Abbiamo trascorso una settimana a Cascais. L'appartamento si trova in una vietta del centro, nella zona pedonale di Cascais, posizione comodissima vicino alla stupenda Prahia da Rainha e a gran parte dei ristoranti e negozi della città. L'appartamento è delizioso, dotato di tutti i comfort, luminoso e pulito, sembrava davvero di essere "a casa". La proprietaria che ci ha accolto è stata davvero gentile e disponibile! Three of us stayed at the Rainha apartment for five nights and we had a fantastic time. The apartment is lovely, it is very well equipped with everything you need. It is in the best location, right next to the streets, shops and bars and you can here the sea. Cascais is a beautiful place. Rainha Apartment is excellent value! It's very clean and the furniture is in great shape. It also feels more spacious than it appears in photos, although we were four adults in the apartment. The best thing about the Rainha apartment is its central location: beaches, rail and bus stations, shops and supermarkets are all very short walk away. Since the location is very central, it's not the most quiet place to stay. However, the apartment is not located in the busy shopping street and there's no noisy bars next to the building. Our small family of three had a fantastic 12 nights stay in Cascais and at the Rainha flat. It had all the comforts we needed and a nice, modern and homely interior, (though the beds were a bit on the hard side). It´s closeness to the small Rainha beach and restaurants/shops were perfekt, we could in less then a minute walk down and have a morning dip in the sea, before having breakfast. My husband and our two children (8,11) had a lovely holiday staying in the Cascais apartment. The flat is modern, clean and bright and very central. It is well furnished and the kitchenette has everything you need. The beach, cafes and restaurants are just two minutes away. The children loved being able to go to the shops around the corner on their own, or pop back to the apartment from the local beach. You can hire bikes very near by but get there early in the morning. They are free but there are no bikes for smaller children. It was well worth arranging transport through Portugal Portfolio from the airport right to the front door in Cascais . We really enjoyed our trip to Cascais. The apartment was wonderful and Suzy was very helpful. We were in Cascais for a conference. Also, please tell Suzy hello and thank her for making our trip so enjoyable. We hope to visit Cascais again.